Crazy paving is known for its diverse and irregularity, its design consist of a many different shapes and sizes that when laid looks “crazy”. 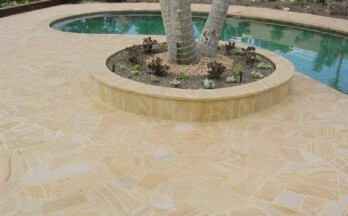 The crazy paving design has crept into the Australian market as crazy paving stones are dense and extremely durable. The Teakwood crazy pave sandstone can be used for both walls and floors as its thickness variations are minimal. The Teakwood has become popular because of its similar appearance to timber, making it a perfect stone for patios, pools and most external applications.